By not denouncing the "church" of Scientology and its assorted and sordid corporate entities, you are aiding in leading the lambs to slaughter. Instead you hide behind thugs hired as bodyguards to keep you from even seeing protesters, going so far as to confiscate signs that tell the truth about Scientology. 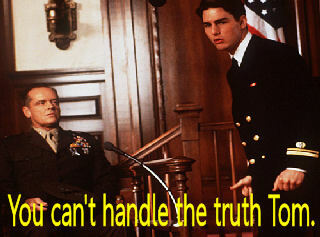 Tom, you are as big a coward as your hero, David Miscavige. In your films, you generally play an ordinary guy that has been placed in a position where you have to make a decision to pursue that dark path or do the right thing. A hero that ends up doing good and getting the girl too. In real life, you are the guy who has chosen the dark path. You are nothing but a shill for a greedy, dangerous and deadly commercial enterprise. You still get the girls, but they don't stick around very long. Why? Maybe because you try to shove your false religion down their throats? Are you proud that people are abused in your name? Don't try to tell us that you don't know that Sea Org Members at the base will take their lumps if you don't like the way your salad tastes. You may have been protected from the truth in Dublin yesterday, but it will not last for long. The truth will come out soon and you will stand naked in front of the world, accused for the uncaring megalomaniac that you are. Prove us wrong Tom. Speak out.